The best MMA card of last weekend really flew under the radar in the weeks and months leading up to it, but once it was all said and done, Saturday night’s Bellator 183 card in San Jose proved to be a much better card than the UFC’s offering in Saitama, Japan on Friday night. The five fights on the main card at Bellator 183 lived up to the billing and then some, and I would argue that in totality it was one of Bellator’s strongest cards in company history, and certainly since president Scott Coker and matchmaker Rich Chou took over operations a few years ago. 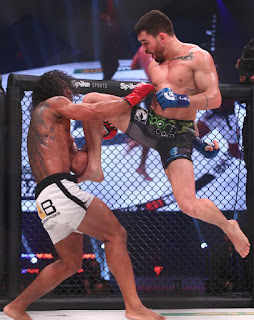 The main event between former UFC Lightweight Champion Benson Henderson and Patricky “Pitbull” Freire was a closely-contested bout that the Brazilian ultimately took via split decision. While this was the weakest fight on the card, it was also a big upset for Pitbull, who has now beaten former elite UFC fighters Henderson and Josh Thomson in back-to-back fights, and with these wins could once again jump into the title picture against Bellator lightweight champ Brent Primus. This was a bad loss for Henderson, who is now 1-3 in Bellator, but his name will keep him in relevant fights. The Bellator 183 co-main event really turned out to be the main event, as Paul Daley and Lorenz Larkin turned in a barnburner of a fight until Daley landed his patented left hook and brutally knocked Larkin out in the second round. This was a huge win for Daley coming off of a one-sided loss to Rory MacDonald, and afterwards the Brit called out fellow Englishman Michael Page. While Bellator has been ultra-protective of Page so far in the way the promotion has booked him, this would easily be one of the biggest fights Bellator could book, especially headlining a card in England. And while Larkin is 0-2 in Bellator, he’s still an exciting fighter who is young enough to bounce back. Another former UFC fighter in Roy Nelson had a triumphant debut in Bellator, defeating Javy Ayala in a spirited three-round affair. Most assumed that if this fight went past the first round it would turn into a slopfest, but credit to Nelson for showing a much-improved gas tank and actually using his grappling for a change. Nelson should now immediately jump into the title picture for Bellator’s vacant heavyweight belt. And Ayala gained some fans with his toughness. 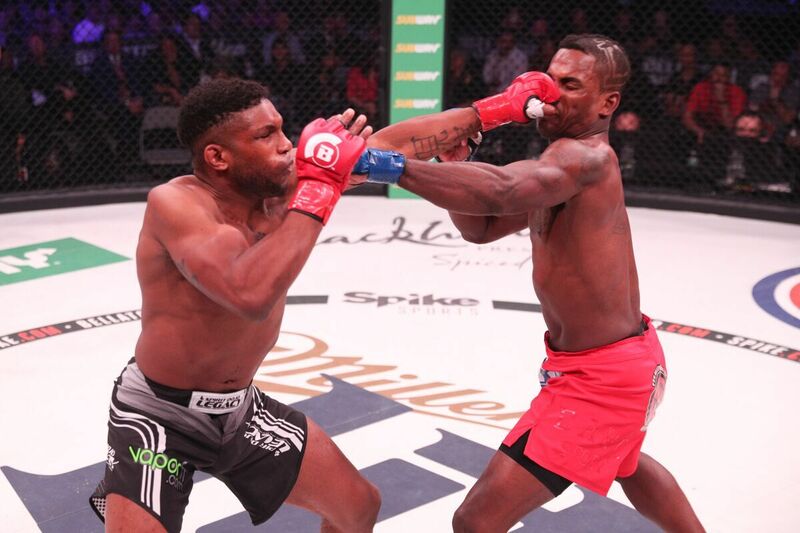 Additionally, two of Bellator’s most promising youngsters both picked up impressive finishes. Aaron Pico, who lost his MMA debut back at Bellator NYC in June, knocked out his opponent Justin Linn in devastating fashion, showing MMA fans and media why there was so much hype behind him before his debut. At just 20 and blessed with athleticism and explosiveness, Pico is going to be a stud for many years to come. 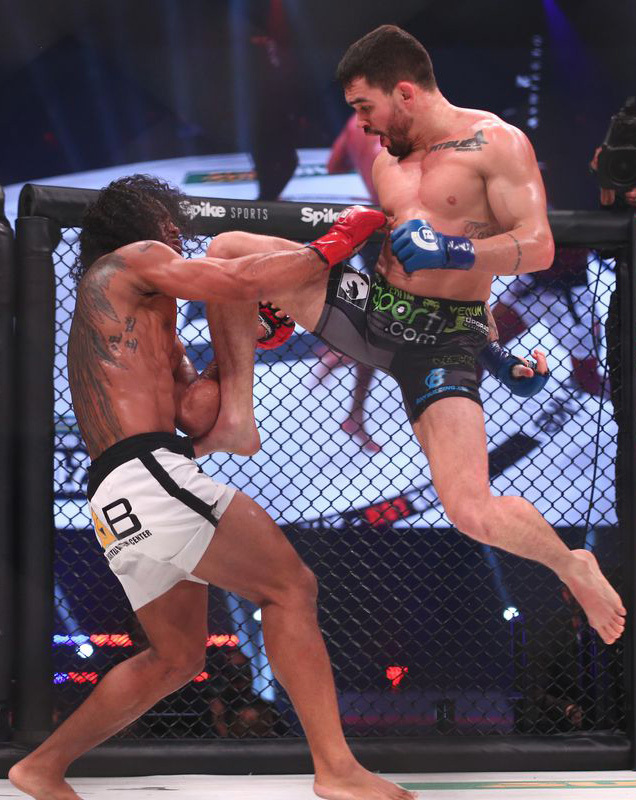 The other youngster who impressed was Goiti Yamauchi, as the 24-year-old moved to 8-2 in his Bellator career with a submission over Adam Piccolotti. Pico and Yamauchi are young and improving, and they will be fighting for Bellator’s featherweight and lightweight belts, respectively, one day. Bellator 183 continues an upward trend for Bellator that started with Coker and Chou coming in a few years ago, and picking up more steam this year with a number of big-name free agent signings and fight bookings. Bellator is still behind the UFC, but the company is doing everything it can to close the gap, and the fact Bellator actually beat the UFC in ratings this past weekend proves it. When you compare the UFC’s Japan card to Bellator’s San Jose card, both of which took place this weekend, you’d have to give the edge to Bellator. Although the UFC Japan card had its moments, there’s no doubt Bellator had the stronger card from top to bottom, and it had more meaningful fights. The competition between Bellator and the UFC is improving the product of MMA as a whole, and that’s a good thing for the fighters who fight and the fans who watch.